Look forward to your patronage during this time of Kwanzaa and throughout the year 2010. Your support in 2009 has been greatly appreciated. Hope you see you all at our Chapter's Dinner Dance. There are still vending spots available. $20 for crafts $30 for vegan food vendors. Make sure you get your membership with the Black Business Builders Club Today. November 17, 2009 Founder and CEO of the National Black Business Trade Association (NBBTA) Lee Green announced today the official start of the 2010 membership drive. National Black Business Trade Association (NBBTA) is a unique business network. Our membership includes experienced professionals and business owners interested in expanding their businesses. Our core philosophy is based on the importance of entrepreneurship, cooperative economics and recycling Black dollars. 3) members develop lasting relationships with other professionals in related fields. * Great Resources. We give you access to cutting edge communications and networking tools. The opportunity to upgrade to a paid membership in the Black Business Builders Club to help increase your income and shorten your learning curve. * Professional Networking. We help introduce you to professionals who are interested in developing referral sources. Our primary objective is to help you network with other professionals in your local community or around the world. We also help organize local networking events and meeting groups so that our members have a regular place to meet with their referral sources. * Marketing Resources. We help connect you to marketing resources that can help you grow your business. * Member Lead Exchange. Need a service? Use our lead exchange to post requests for service to other members of the NBBTA community. It’s our way of bringing our professionals together. * Directory Listings. As a member of NBBTA you receive an online directory listing. Our directories are reviewed by consumers who are seeking professional services. » About Our Members. We are looking for energetic members with experience and an interest in growing their business. Our members include: business owners, any professional that services a business, accountants, attorneys, financial planners, insurance agents, real estate professionals, executive consultants, and HR, marketing and sales professionals, contractors, architects, engineers, home based and home services professionals. » Where Our Members Are Located. We have members in every major city in the United States. » Good Relationships Produce Business. Our innovative community fosters the development of business relationships among professionals. Every new member that joins NBBTA adds value and opportunity. To find out more information go the website http://buckfiftymiracle.info/nbbtafree.html and put Clarence Coggins as your referrer. Are You over Looking a Viable Market? While many people are looking at the youth of the nation for sales, don't you miss out a market that has plenty of dollars to spend. That market is the Baby Boomer Market. They are more mature, less expenses and are ready to do business with you if you know how. Here is an article that shows 5 Ways to Market to a More Mature Consumers. I hope you enjoy it. Are you Giving Thieves The Keys To Your Car? happened, and found but I was part of a new, and very successful, scheme being used to gain entry into cars. parking lot watching for their next victim, it will not be you. your key chain, it sends the code through the airwaves where it can be instantly stolen. be sure we remembered to lock them -- and bingo, someone has our code....and whatever was in our car. Snopes Approved --.Please share with everyone you know!! Club are working together to start local Black Business Awareness campaigns. over 67 thousand Blacks according to the US Census Bureau 2000 data. Coggins (aka Crown PRince of WeB 2.0), Project Coordinator. that teaches it members how to use the Internet to generate income from home. the most out of the club and the internet. Well I guess the Millionaire Mind Intensive will be having one less participant. Clarence Coggins, the Crown Prince of Web 2.0, has been placed on the Persona Non Grata list. Why? Because of a Youtube Video Taken Posted over a year ago. The Following is the correspondence between myself and Peak Potential. Up to the part where I call Harv a Jerk and let him know that he could stick it in his "Briefs". Like they know nothing of freedom of speech up north in Canada. They think that just because they may have a little money they can just boss people around. Well they ran into a Bible Believing American this Time. Like I really have much better things to do than go protest an event. More importantly, there are many more events and programs one can attend. I just don't like their attitude. It STINKS. Please bear in mind we will be monitoring your YouTube postings and will take all appropriate action, in suitable forums and venues, relative to defamatory, inaccurate or disparaging material you post, in addition to the removal by YouTube of your “work.” Please be advised our event staff has been notified you will not be permitted entry to our event, and will have you removed by the venue or authorities, appropriate to the situation. Any filming of our event, staff or clientele is unauthorized by Peak Potentials and will also be dealt with. If you have any questions regarding the foregoing, or our intent to carry through, please feel fee to contact me. You will find that you have never been charged $97 for the upcoming MMI in New J ersey 2009. J ust make sure you refund my registration fee. Because if you had made this information available to me when it came to your attention I would not have made a registration. And expect me to make Youtube video about the prohibition of me attending the event. You recently registered to attend the Millionaire Mind Intensive in Secaucus New J ersey . We wish to inform you that you will not be permitted to attend this event or any other future Peak Potentials programs. This decision was based on your unauthorized posting of Millionaire Mind Intensive video on You Tube. I just wanted to share this article written by David Farad with you. I found it quite illuminating. Let me know what you think. 1. FEAR - Fear of failure, Fear of Loss, Fear of what others might think if we embrace our Blackness. (The opposite of fear is FAITH)! 2. Mistrust - Lack of trust in working with other Black folks. 3. Complacency & Apathy - The "I got mine, get yours" mentality. there are numerous Blackorganizations that are doing this and more! organizations. One such organization is The Black Business Builders Club (BBBC) found at http://hudsonliberty.com/dumff/women. in "doing" whatmany ask of only the rich. p.s.s. Look for the Black Business Builders Club in the June 2009 Edition of Black Enterprise Magazine!! 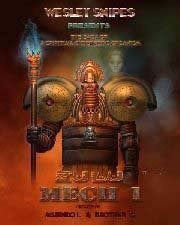 New York, NY (BlackNews.com) - Zulu Mech 1, a breakthrough African sci-fi adventure series co-produced by Wesley Snipes, will be unveiled on May 30th at The African American Pavilion at BookExpo America. The press conference is scheduled for 12:00 noon in the African American Pavilion Meeting Room 1C01-1C02 at the Jacob Javit Convention Center, New York City. An innovative combination of animation, music, movie techniques and fine art paintings called a "Cinema Graphic Novel," Zulu Mech 1 is an adventure designed to promote literacy, hope and world peace. Creators Mshindo I and Gregory Walker, aka "Brother G," the award winning author of the Shades Of Memnon historical adventure series, will be on hand to introduce their epic, as will Snipes, star of the Blade movie trilogy, who serves as Zulu Mech 1 co-producer and voice talent, also scheduled to appear is Jonathan Woods, animation director and music composer. Then at 1:00 p.m., activities will shift to the African American Pavilion stage for a presentation entitled "African Legends Past And Future" that closes with a screening of the first Zulu Mech 1 adventure. Upcoming episodes will soon be available on Apple iTunes. "I think Zulu Mech 1 is a grand adventure," said Snipes. "Everybody knows I love sci-fi, I am always looking for a hot new property and I think I found it! If the fans liked the stuff we did on the Blade series, they are gonna love this. Zulu Mech 1, as written by Brother G and illustrated by the amazing Mshindo brings a fresh, untapped perspective to scifi. I think the world will be pleased. Our hope=2 0is to develop ZM1 into one of the hottest franchises around." BookExpo America, one of the largest book trade shows in the world provides independent African American book publishers, authors, self publishers, bookstore owners, librarians, distributors, literary agents, publicists, and African American imprints at major publishing houses with exposure to more that 80,000 bookbuyers and booksellers from across the world. With over 25,000 BEA attendees crossing up and down the African American Pavilion Aisles, there will be huge opportunities to learn, share, educate, buy, sell, and network and the pavilion provides our exhibitors the lowest discounted booth prices at the BEA.